Cold-pressed natural dog food. With all the major parts of a natural prey. A complete dog food. The fact that the dog has evolved from the wolf has been scientifically proven and throughout the millennia of domestication*, the digestive system has remained relatively unchanged. The dog mainly fed not only on the meat of its quarry, but also the bones, internal organs, such as the tripe and its contents (partially digested grass and other plant substances), bodily fluids and pelt. His diet also included berries, herbs, fish and insects. All vital nutrients required to evolve and live healthily were present in this natural prey and this has always been at the forefront of the development of our cold-pressed near-natural food. 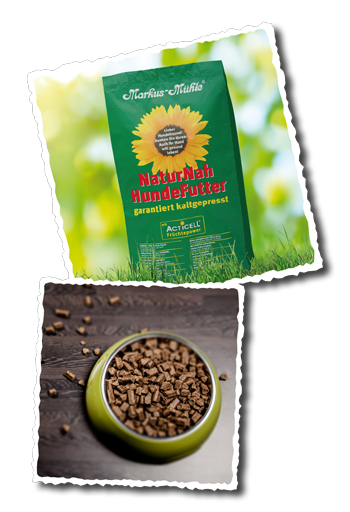 Together with nutritional experts we have developed a premium complete food for all dogs, which is designed specifically to meet your dog’s needs via its near-natural composition and nutritional production method. High bioavailability is achieved by an optimal energy value of 367 Kcal per 100g, pulverization of the ingredients and very good digestibility. *) As domestication is called the domestication of wild animals by humans. Dried chicken meat meal 28%, thermally pre-treated maize, thermally pre-treated brown rice, game tripe meal 8%, rice germ, game bone meal 5%, maize germ, Jerusalem artichoke, marine fishmeal 5%, BetaVulgaris, cold-pressed linseed oil, cold-pressed rapeseed oil, powdered egg yolk 2%, dried moor, powdered fruit 2% (carob, pineapple, papaya, banana, acerola cherry, apple, pear, blueberry, mango, raspberry), dried mixed herbs, salmon oil, powdered marine algae, powdered dried Yucca Schidigera.